[INFO]      Argument Description: The name of the application. [INFO]      Argument Description: All of the files to place in the resources directory. Including all needed jars as assets. [INFO]      Argument Description: Command Line Arguments to be passed to the main class if no arguments are specified by the launcher. [INFO]      Argument Description: The classpath from the main jar of the application, relative to the assembled application directory. [INFO]      Argument Description: Icon for the application, in ICO format. [INFO]      Argument Description: JVM flags and options to be passed in. [INFO]      Argument Description: JVM System Properties (of the -Dname=value variety). [INFO]      Argument Description: The main class for the application. 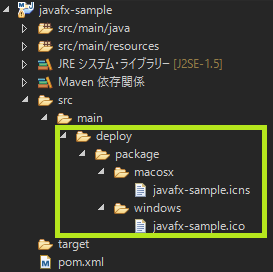 Either a javafx.application.Application instance or a java class with a main method. [INFO]      Argument Description: The main jar of the application. This jar should have the main-class, and is relative to the assembled application dir. [INFO]      Argument Description: The preferences node to search for User JVM Options. The format be a slash delimited version of the main package name, such as "com/example/myapplication". 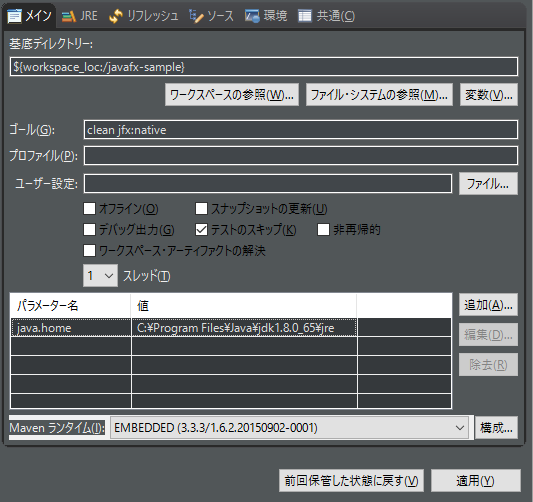 [INFO]      Argument Description: For JavaFX applications only, this is the Fully Qualified Class Name of the preloader class. This class needs to exist in the classpath, preferably early in the path. [INFO]      Argument Description: JVM Options the user may override, along with their default values. [INFO]      Argument Description: The version of this application. [INFO]      Argument Description: The Java Runtime to co-bundle. The default value is the current JRE running the bundler. A value of null will cause no JRE to be co-bundled and the system JRE will be used to launch the application. [INFO]      Argument Description: The copyright for the application. [INFO]      Argument Description: The license file, relative to the assembled application directory. [INFO]      Argument Description: If the bundler can add the application to the system menu, should it? [INFO]      Argument Description: If the bundler can create desktop shortcuts, should it make one? [INFO]      Argument Description: Should this application attempt to install itself system wide, or only for each user? Null means use the system default. [INFO]      Argument Description: A title for the application. [INFO]      Argument Description: The vendor of the application. [INFO]      Argument Description: Adds a dialog to let the user choose a directory where the product will be installed. [INFO] Description: Creates JNLP files and directory layout for WebStart invocation of the application.